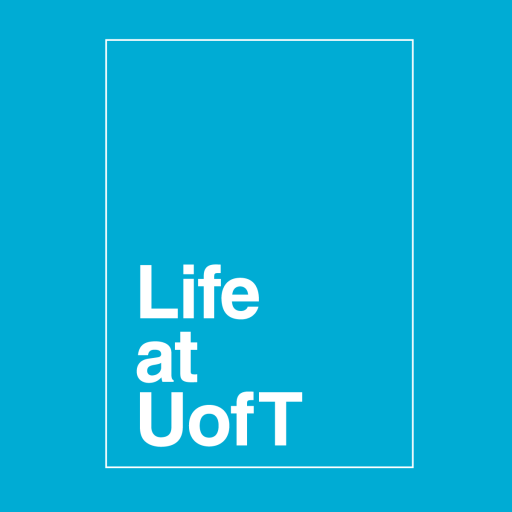 I’m assuming you’re an lifeatuoft fan – after all, you’re reading my post. 🙂 But if you’re clicking around lifeatuoft, then you might just be a blog fan in general. There are a lot of great blogs on the internet – in particular, there are a lot of great blogs for students. I’ve compiled a list below. Most of them are U of T-based, but a few aren’t, yet I wanted to include them because they could be of interest to students of any university. Some of the blogs are anecdotal and others are informative; despite the varying styles, each blog has something awesome to offer you. Surviving Studenthood: Do you remember the awkward stages when you morphed from a teenager into an adult? And how, in those moments of painful embarrassment, a bit of guidance and encouragement was always helpful? Well, Surviving Studenthood is based on the same concept! It’s a blog designed to help you through the awkward moments of “studenthood.” For example, one of my favourite posts, The Only Sober Apple in a Drunk Barrel (a play on the phrase “there’s one bad apple in every barrel…”), recounts a student’s frustration at being the only sober student at a university social event. The post suggests some tips on how to deal with that situation while remaining true to your beliefs. In addition, the blog encourages students to share their tips – I’m sure many of their posts recount situations you’ve experienced and you probably have some great ideas! 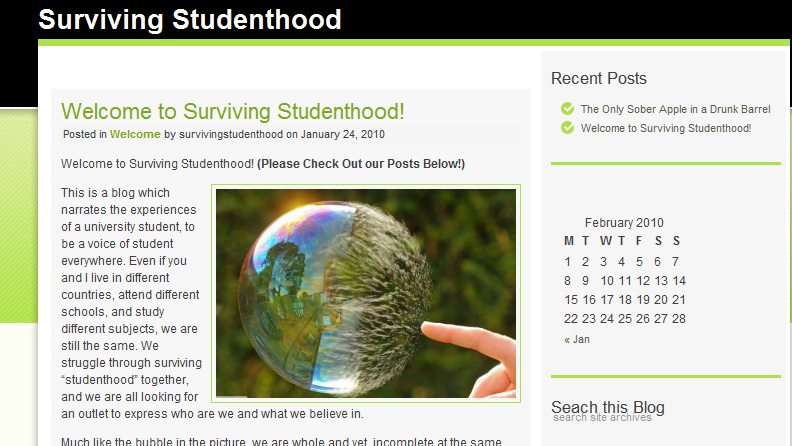 Although Surviving Studenthood is a relatively new blog (and thus, there are only a few posts so far), I highly recommend it to you! UeaT: Ah, if you are anything like me, eating and studying go hand-in-hand (hence the “Freshman 15” becoming the “Undergradute 30”)! 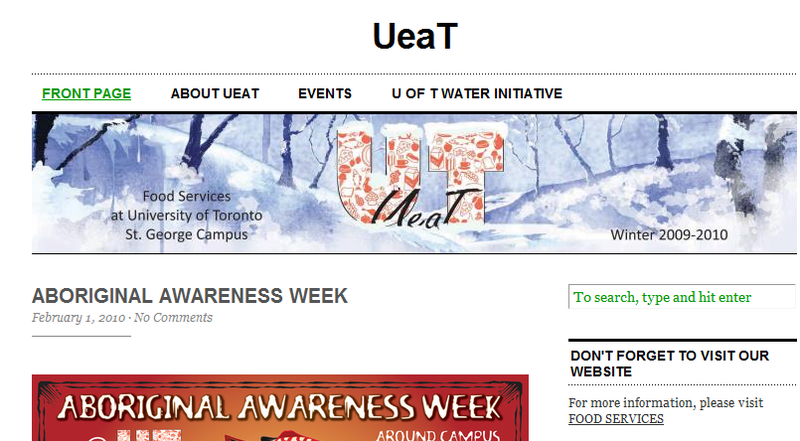 UeaT is a great U of T blog – it’s the official site of University of Toronto Food Services and it blogs about all of the food news around campus. As you may know, Aramark is the main food provider at St. George campus but there are a lot of independently owned food options on/around campus that you may not know about and which UeaT has the scoop on (pun was not initially intended, but now I like it J). UeaT also covers food events – for example, one post talks about the February Postcards, which are all over eateries on campus, indicating that this month, you can participate in Aboriginal Awareness Week, ring in the Chinese New Year, and celebrate Black History Month by trying foods from all of these cultures. Oh, and they have a cool interactive campus food map! Alumni Circle: Alumni Circle is a very cool U of T blog, which features alumni in the news, a schedule of alumni/interesting events, alumni awards (including the prestigious Gordon Cressy Student Leadership Award, which might interest you, fellow student!) and much more. I know, I know, the blog is for U of T Alumni, but it’s a wonderful way for students to learn about the alumni experience, which I know is particularly valuable to upper-year students who are now thinking about how they can take their university degree and use it in the real world. 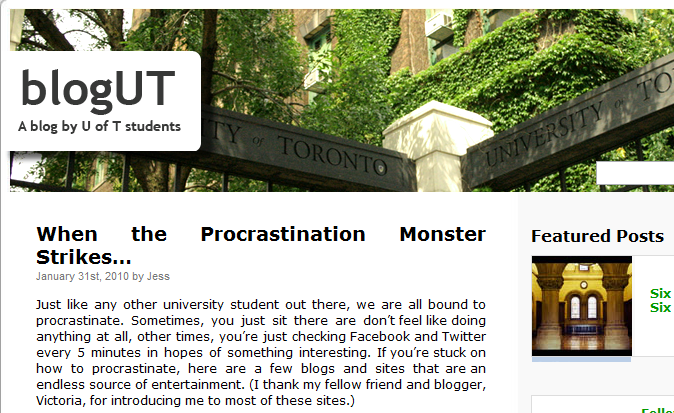 In addition, Alumni Circle links to the fantastic U of T Magazine website, which has a special section of blog posts. Blogs are a great way to get information from unconventional sources (in comparison to an official U of T webpage), because they add a personal spin to regularly updated information sources. In additon, you can gain insight into areas which you may not normally have access – for example, many students may not get the opporttunity to hear alumni experiences, but the Alumni Circle blog share interesting stories and interviews that might open students’ minds. Thanks for the wonderful info Fariya! I didn’t know about these blogs until you mentioned them. Haha. Thank you for including us in your list of top blogs students should know about! We’re excited to be featured in your post and we are happy to announce we have added a few more posts that might interest and amuse students. You have a great blog here at UpbeaT, and we look forward to your new posts and becoming avid readers. Keep it up, and I hope you come back to Upbeat often to check out our posts. We have a team of five fantastic writers, and I know we have many more exciting posts to come in the future. Awesome post Fariya! The team at UeaT is delighted to be included in your list. Keep up the great work informing students of the University’s hidden gems. Thanks for your comment – I love UeaT and their awesome ability to scope out great deals on campus. Those $5 March meals were a hit! Thanks! Next Post I <3 the Library!